I’ll admit that I wasn’t the most in tune person when it came to motherhood. I didn’t know much about diaper genies or baby food and I certainly didn’t know much about teething babies. Or how they put everything in sight in their mouths when they are teething. Holy goodness. A few weekends ago, I went to Strawberry Festival with a good friend and her eleven month old. As we were walking back from the fest, I felt a gravitational pull to a tent called Chompy Chic Chewlery. 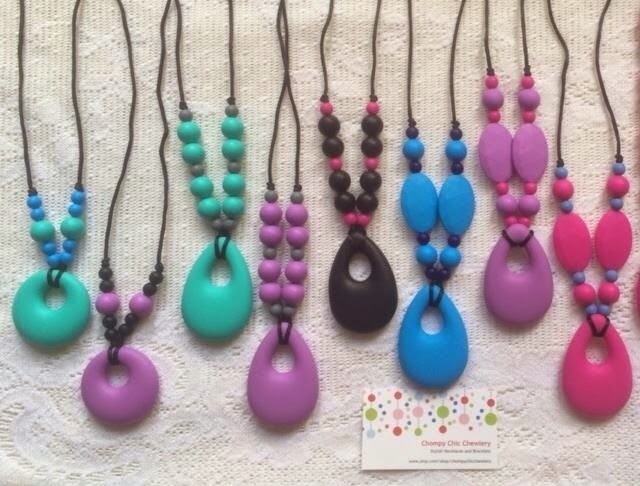 I was completely intrigued to learn about the teething necklaces that are completely safe for babies and keeps them busy without have to worry about your necklace breaking and still being fashionable. It IS possible mamas!! I ended up having to buy a couple. They come in a fantastic array of colors and lucky for you we are teaming up to give one lucky winner a pendent of the color of your choice just by entering! Use the rafflecopter to enter to win and answer this question below: Which color would you pick? I would pick teal or blue, bright fun colors! I love the combination of them! i love pink! it's such a girly color! I'd pick the furthermost right one in the photo! Love the blue! The third from the last. Gorgeous color! Wife would love any of them, especially the teal ones.